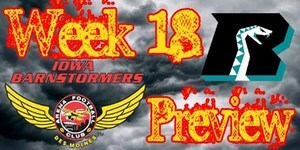 The Barnstormers were defeated last week by their division leader, the Milwaukee Iron, by a score of 67-75. Milwaukee struck quickly and the Barnstormers answered back with a Rodney Filer carry. The back and forth battle continued through the first quarter keeping the score tied. The Barnstormers big break came in the second quarter on a Tanner Varner interception that he ran in for 56 yards and a touchdown to bring the Barnstormers ahead of the Iron, a lead that they would hold onto going into halftime with as score of 41-35. Coming out of halftime the Barnstormers’ momentum was struck with two back-to-back touchdowns by the Iron. The Barnstormers scored once again on a second Rodney Filer carry, but the Iron struck twice again taking the lead from the Barnstormers. Quarterback Ryan Vena was able to connect twice with Larry Kendrick and once with Errick McCown for touchdowns, but the Iron were always able to answer back and maintain their lead to come out on top with a score of 75-67. The Arizona Rattlers are a playoff contender this year as they are second in the National Conference, West Division. After a 2-3 start on the season the Rattlers went on to a six game winning streak starting with their victory over the Barnstormers earlier this season 52-48. The Barnstormers are looking for redemption and to end their season with a victory. Iowa Barnstormers @ Arizona Rattlers will be broadcast LIVE on the radio on 1700 AM The Champ, and on the Internet at www.theiowabarnstormers.com and at www.nifty-tv.com. -This is the ninth meeting between the Arizona Rattlers and the Iowa Barnstormers. The Rattlers currently lead the series 6-2. -Leading Tackler: Terrance Sanders (#) - 15 GP, 87 tackles (71 solo, 16 assisted), 3 interceptions for 44 yds, 10 pass breakups. Errick McCown-WR-#5 Week 17 Line: 10 Rec for 101 Yds and 2 TDs. McCown has shown that although he doesn’t quite have the height of Jesse Schmidt or Todd Blythe he can make just as big of catches. McCown opened the season with six receptions for 86 yards. McCown was later placed on Injured Reserve in the middle of the season with a quad injury, but once he was able to come back into the game he held nothing backing making his debut in Dallas with seven catches for 62 yard and a touchdown. McCown couldn’t have come back at a better time with both Tommy Ellingworth and Todd Blythe struggling with injuries he stepped up to the plate. Last week was McCown’s best showing of the year and would love go end the season with a bang. Iowa Barnstormer 2011 Season Tickets are on sale now! Call the Barnstormers office today to get yours at 515-633-2255!